Hemingway's terse, lean style seemed to come out of nowhere. Evelyn Waugh reckons he got it from the effete Ronald Firbank. 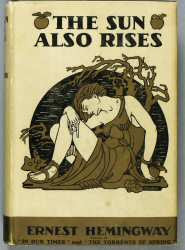 Certainly Firbank , possibly accidentally, was the first (1915) to make the break with past novels in the way that he showed rather than told what was going on, something key to the modernist style - little description, much dialogue and never a word too many - often with the readers having to supply background themselves. Ernest Hemingway. The Sun Also Rises. THE SUN ALSO RISES. Scribner's, NY 1926. Hemingway's first novel, the defining book of the Lost Generation and one of the key books of the Modern Movement. He came to represent that generation that had survived WWI, in the way that Kerouac did the Beats. The fruit of Hemingway's sojourn in Paris where he associated with Gertrude Stein, F. Scott Fitzgerald, Ezra Pound, Ford Madox Ford, Robert McAlmon, James Joyce and Kiki of Montparnasse. The book's plot follows a group of world weary expats who aimlessly journey from Paris to Pamplona for the annual "running of the bulls." The most wanted of all his books and nearly the most valuable. There are points on the book - the first issue, in the first issue dust jacket, has the title of his earlier story collection incorrectly identified as In Our Times on the front of the jacket and 'Stoppped' (3 p's) for "Stopped" on p.181, line 26 of the text. The entire first printing -- first, second, third and later issues -- consisted of only 5090 copies so the first state ones have become uncommon and very expensive especially if handsome. VALUE? The book has risen considerably in value in the last 30 years It has twice made over $45K this century. There are copies sitting on the web at $60K +. These are first states in jackets that have survived well. 1926 is getting fairly early for jackets. An ordinary simple 1926 jacketless first can be had for a little over $1000 a bit more if smart and bit more again if first state. It is not unknown in fancy bindings. With a long inscription by Hemingway about the novel to Dr. Don Carlos Guffey, (a book collector) and obstetrician who delivered Hemingway’s two sons by his second marriage, the inscription running to 20 lines and filling the front free endpaper: “To Dr. Don Carlos Guffey — Dear Dr. Guffey: —Since you are a collector, marks, mis-spelled words and other evidences of seniority in a volume are probably more important that how it was written but if it is of any interest to you the first draft of this book was commenced on my birthday, July 21 , in Madrid and it was finished September 6 of the same year — in Paris [these last two words added by Hemingway in pencil] — It was written at Madrid, Valencia, Madrid, San Sebastian, Hendaye and Paris — after it was finished I wrote The Torrents of Spring in the week preceding Thanksgiving of that year. — In November we went to Schruns in the Voralberg in Austria and there I re-wrote the 1st part of this book — went to N.Y. and came back and re-wrote the rest — the portrait on the jacket [the back of the jacket carries a reproduction of a drawing of Hemingway by John Bloomshield, dated Paris 1925] was by a twirp who said he was making drawings for Vanity Fair and then sold this, which he got me to sign [Hemingway’s facsimile signature appears below the drawing], to Scribners — Ernest Hemingway.” In addition, Hemingway has annotated the dedication page, which is printed: “This book is for Hadley and for John Hadley Nicanor.” Beside his first son’s name Hemingway has pencilled: “only child of any sort of E. H. not born through Caesarian section.”. An exceptional copy: in fine condition (now very rare) and with a marvellous inscription. I have this book the same in description, but there is no dust jacket, is still have a typo error like "stoppped" and Down-staris,. still complete in pages, not in very good condition.. there is a value?